Thank-you Ozeri for sending me these beverage glasses for review. I was not paid for this review and all opinions are 100% mine. Made of durable, heat resistant, mouth-blown borosilicate glass of the finest quality, the 12 oz. Serafino glasses are the largest in the Ozeri Artisan Series of award-winning handcrafted drink ware. Borosilicate glass is stronger than common glass, shatter-resistant and with the Serafino's double-walled design, it offers the ultimate insulation to maintain drinks at their ideal temperature. The Serafino's unique double wall design suspends drinks within an inner wall for an attention-grabbing optical effect, while the wraparound contour provides a natural aesthetic grip. Each glass is made to keep your hands cool even with your hottest drinks and free of condensation with your chilled beverages. The patent-pending Serafino is great for coffee, cappuccinos, hot or iced teas, cocktails, frozen beverages and much more. Each set contains 4 handmade glasses designed for lifetime use. The Serafino glasses are completely dishwasher, microwave and freezer safe and ship in an elegantly printed and carefully packaged box with a 1 year warranty. I was pleased with these glasses and the design. 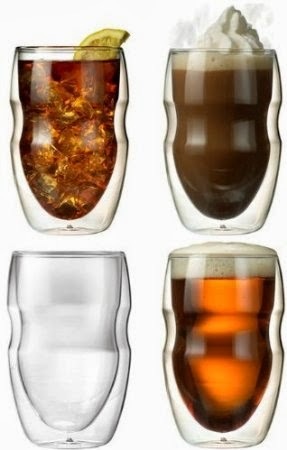 I have never used glasses with hot beverages but the design of these glasses will warm the glass but not make it hot. The glasses feel very light weight so it makes me wonder about the shatterproof ability but I was not willing to drop one to find out. The glasses are smaller, 12 ounces which is nice for juice and tea. These glasses come in a four pack and you can order your's on Amazon.